On Sunday, May 8, 2016, the College of Engineering at Alfaisal University held its Second Engineering Design Expo and Competition. 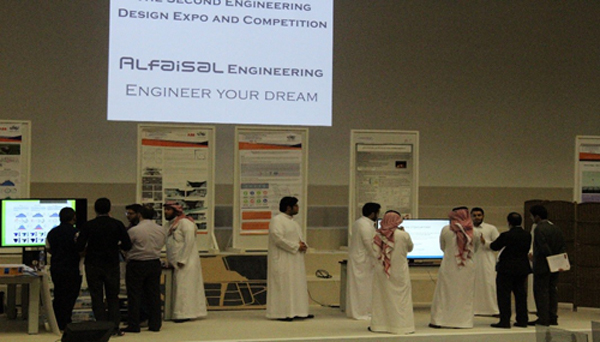 The event showcased graduation projects from sixteen teams across the College’s five engineering programs. For each project, the Expo represented the height of at least year-long effort invested in design and implementation of a solution addressing one or more real world problems. The projects also emphasized relevance to the local society, as well an understanding of state-of-the-art engineering practices, technologies and trends. Students presenting their work demonstrated both capability to pitch their ideas and products, as well as good knowledge of their respective field. With the project satisfying a core element of their graduation requirements, the students (both female and male) seemed ready for today’s marketplace. ABB Saudi Arabia sponsored the event, and have shown great interest in both the students’ work and presentation. They also indicated enthusiasm in participating in future events. The competition featured work from undergraduate students where the students presented their work to an audience made up of fellow students, potential employers, and professors. The competition had five tracks; each track represented an engineering discipline. Namely, Architectural Engineering, Industrial Engineering, Mechanical Engineering, Electrical Engineering, and Software Engineering. A total of 16 projects participated in the competition. The projects were evaluated by 8 jury groups each consisting of 3 faculty members. The jury selected the best two projects in each track.